Apologies: ZL2CZE, ZL2RB, ZL1FS and ZL2DC. Present: Mike ZL2VM, Lee ZL2AL, Dave ZL2DW, Dave ZL2MQ, Rob ZL2US, Stan ZL2ST, Mike ZL2MY, Willy ZL2AGD, Wally ZL2MO, Bert ZL2OC, Revell Troy and Karl ZL1TJ. Minutes of the previous meeting, confirmed correct: ZL2VM, ZL2MO. Arising: Inadvertently omitted from the August record was the scrumpteous birthday cake Jan ZL2CZE contributed to the after meeting cup of tea. Dave ZL2MQ reported on the Maraenui Golf Club’s catering for the annual combined branches end of year dinner. This is in hand, the cost to be similar to the previous year’s ($28.00 per person) and will take place on Friday November 29th. Correspondence: Inwards: a letter from the Napier City Council advising that our application for a slice of the 2013-2014 Community Services Grant was turned down. Our mistake was to ask for a replacement radio for Civil Defence HQ, which is a ‘capital’ item and does not qualify. We are invited to apply again next year. Finance: Stan reported receipt of $175.00 from the Car Rally people, $60.00 from the sale of surplus items actioned by Willy ZL2AGD and Wally ZL2MO who at the same time managed to make the club rooms a great deal tidier. Laurie: the Tait radio is in need of some refurbishment, cost to be about $200. Mike ZL2MY reported the accidental death in Southland of Collin Robertson, ZL4KJ, who was a regular visitor to the club when in Napier, visiting family. Lee mentioned Warren ZL2AJ obtaining his DXCC qualification. An offer from ZL2AGD and ZL2MO to paint the interior of the club rooms was accepted with thanks by Laurie. The club to purchase the paint. 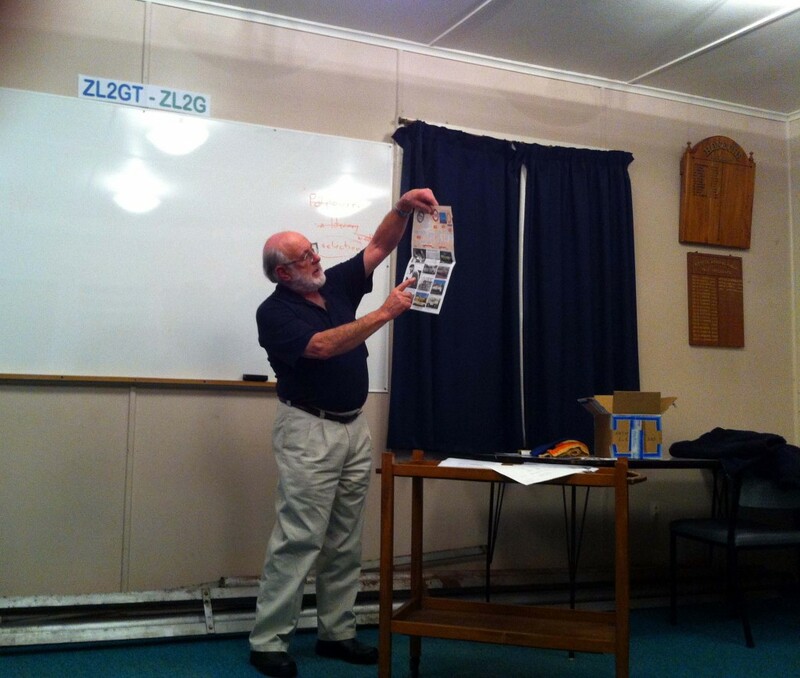 David Walker ZL2DW: a brief history of Radio in Hawke’s Bay. 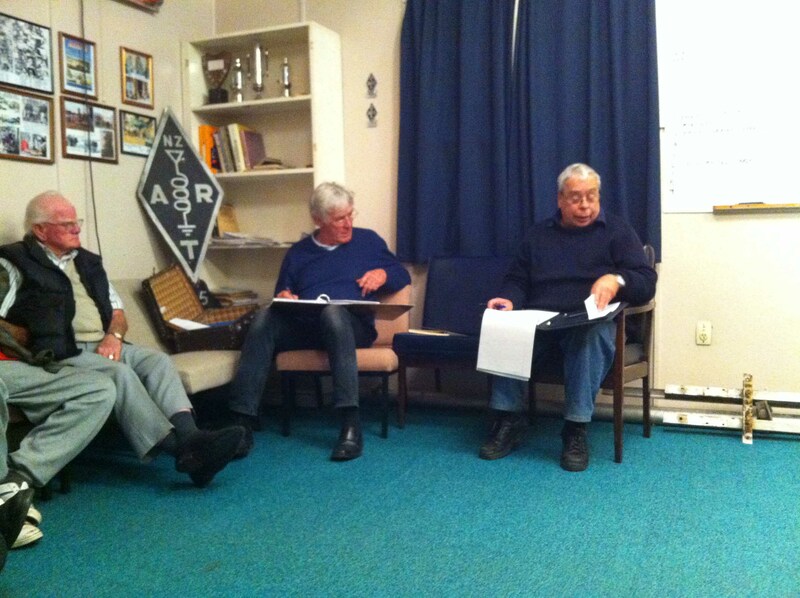 The meeting was followed by David ZL2DW’s potpouri of reminiscenses on the early years of radio, ham radio, broadcast radio, TV, Toll links, VHF land mobile radio, HF land mobile radio etc. in Hawke’s Bay. With occasional comments and additions by Laurie ZL2TC and David ZL2MQ. Branch 13 was inaugurated August 1946, at a meeting in the home of Bill Lester ZL2GB. Branch 25 came into being not long after on October 13 at a meeting at Viv Townsend ZL2ACW’s place. In the 1950’s, WWII communication gear like the ZC1 was not only favourite with radio hams, public services like the Hastings Electric Power Board used these for communications at the top end of the broadcast band. Receive only sites for the HEPB were established at Kereru, Te Mata and Te Pohue, all fed back to the Control Room via UHF links through the Te Mata site. All base transmissions came from an aerial on top of the central Hastings HBEPB building. Gordon Hannan ZL2JJ was a radio operator for the HBEPB in the 1980’s and 90’s. Dave, ZL2DW shows a piece of history from his collection of material. Broadcasting stations were established at Opapa and Pakowhai in 1938 and 1957 respectively. The Pakowhai aerial system being mounted upon a large ground plane radial system which is still tested annually for continuity etc. David referred to his article in the 2007 January/February issue of Break-In titled “Opapa and the spy”.It relates to the WWII story about what was assumed to be a Japanese spy who was seen taking pictures of the Opapa site during his operations throughout NZ during 1943. The New Zealand Electricity Department established an HF radio network about 1954 using Collins equipment. This was replaced with Codan SSB gear in the mid 1980’s. David worked on both types of equipment. He noted that almost without exception technical establishment and support of equipment were done by technicians who were also licensed radio operators. During his career David saw many changes and technological advances, the latest being the switch to digital television. The local newspaper recorded him switching off the redundant analog TV4 transmitter.